Welcome! Here you will find information about the latest, relativistic version of the transactional interpretation of quantum mechanics, ‘RTI’, blog posts, and an opportunity for informal discussion. The transactional interpretation (TI) is a new way of understanding what’s behind the formalism of quantum physics. My book for the general reader, Understanding Our Unseen Reality: Solving Quantum Riddles, was published in 2015 by Imperial College Press. I was so happy to see (on arXiv 4/25/12) that you are still advancing the transactional interpretation and may author a book on it. I got into physics with the goal of understanding the natural world but was thwarted by how QM was taught (I read Bohm before taking my first QM class). I am now a retired engineer and am trying again to make sense of QM (Sakarov toast: “To the success of our hopeless cause!”). Since I read TI back in the 1980’s, I believe that TI must be included in any correct QM interpretation. One problem I would like to see addressed is how TI can work for stationary state atomic bonding (e.g., H2+) where psi*psi enhances effective e density between atoms. I like your “possibilist” clarifications and have been calling them sub-QM simulations of all possibilities (e.g., how does a single photon go through glass? To get an effective index n, it must interact with billions of electrons in the glass– that must be done in pre-sub-background prior to detection. ). That also suggests that each cubic femtometer of space is similar to an awesome computer of some sort. I’m not that worried about collapse/measurement because it could be that Nature really does use an effective random number generator rather than some complex emergence process (I picture the wavefunction carrying a pointer key like say the theta,phi angles on a unit sphere– and a choice may be made by closest match with a similar pointer on an absorber). TI hasn’t been accepted as much as it deserves. Keep up the good work. Thanks, Dave! I’ll look into the atomic bonding situation. Re index of refraction: technically this involves scattering, so in that sense it’s not the ‘same photon’ propagating through the glass. It’s similar to the scattering described in my arxiv paper, but with a photon OW interacting with Dirac fields in the glass molecules and being changed in the process. But I agree with your point that all of this happens on a sub-empirical level. I’m hoping that my book might help to open up the discussion a bit for reconsideration of TI. Since the sub-quantal reality is so different from our classical reality, language and terms are difficult. Bohr discouraged discussion by insisting that sub-QM be described by classical terms (if at all), and having so many different interpretations of QM impacts agreements on terms. The word `real’ is especially dangerous. In TI, the `reality of psi’ is similar to the `sound of one hand clapping.’ The `one hand’ is real, but not much in classical terms. As a weak expression, psi lives in the `square root of reality.’ Psi may be called a superposition and interference of all `possibilist information’, and PTI is a necessary addition to TI. It is conservative and responsible (and I don’t think it should be controversial) but might go much further. We may never know the true nature of the information substrate, and it would be nice to have a name (WEB, spacetime network, Wilczek’s GRID?). For now, possibilist world may have to suffice. I like your discussions in [ArXiv:0906.1626]. The difference between time dependent processes and time-independent states could be emphasized. TI explains the Born rule for time dependent processes, but the Born rule operates in time independent states without any collapse or potential measurement. I thought there was a problem with Cramer’s theory of neutralization of waves behind the emitter in that absorber theory assumes 4-pi coverage but TI only talked about one or a few possible absorbers (and often about just one dimension). The neutralization depends on every direction of offer wave eventually encountering some responder. Maybe that was implicit. Agreed: Psi (or more generally the quantum state) does not describe something that exists in classical terms, but as you note, “real” is a dangerous term because it is generally equated with ‘classical’. The reason I don’t think Psi exists in spacetime at all is because of multiparticle states: these have too many dimensions to fit into the 3+1 dimenstions of spacetime. Chapter 8 of my forthcoming book describes how spacetime can be seen as emergent from a realm of quantum possibilities. In fact, I think you will find much of what you say above addressed in the book (I talk about the history including Bohr’s take on QM). Re Cramer’s 1986: yes, it is assumed that the ‘future absorber’ is complete in that presentation. Cramer has an alternative for cancellation of all remnant advanced/retarded waves in case of an incomplete absorber: perfectly reflecting past boundary condition. I became interested in TIQM last year and wrote Prof Cramer with some comments and questions but never got a reply. (Is he still active research?) I am posting my email here so that maybe you or anyone else who reads it can reply or comment. I realise that you are probably too busy to reply. I have started working through your papers starting from the 1980 Generalized Absorber theory paper. I see that what I said in my previous email about the emission of the advanced wave backwards in time is indeed understood in the conventional interpretation to be a description of an ordinary wave coming from the past and being absorbed. The way I see it WF absorber theory gives equal weight to advanded and retarded solutions but I am not convinced that it has any real “physical content”. If I give $10 to you over an interval starting at t1 and ending at t2, a WF treatment would say that over the interval t1 to t2, I give $5 to you and you give an additional $-5 to me backwards in time and that for t > t2 I am continually trying to you give you $5 while you are continually trying to give me $5 so that we keep calling it quits, and that for t < t1, I am continually trying to give you $-5 backwards in time while you are continually trying to give me $-5 backwards in time so that again we call it quits. All very nice and symmetric in the use of both a 5 and a -5 but ultimately just a case of playing games with numbers and language, because the net observable physical result is that no transfer of money occurs for t t2 and that in between t1 and t2, $10 gets transferred from me to you. The way I see it, if something quacks like a duck, we should call it a duck and an advanced wave carrying negative energy backwards in time quacks like an ordinary wave carrying energy forward in time, so lets just call it that. The biggest weakness of the transactional interpretation is the pseudo-time narrative of which talk of waves going backwards in time is part and parcel. I am interested in understanding what the transactional interpretation is actually saying if we drop the talk of backwards propagation in time which despite its obvious appeal is nevertheless dubious on at least linguistic and philosophical levels if not physical as well. I have read Ruth Kastner’s Causal Loops paper and agree with her analysis of the probabilities and I would add that even without going into the probabilities, Maudlin’s criticism of the transactional interpretation is invalid anyway because he confuses the pseudo-time narrative with actual time, when it is instead an informal heuristic argument based on the dubious notion of backwards in time propagation. For me the gist of the transactional interpretation is that there is more than just the usual wavefunction Psi present, there is also the so called “confirmation wave” which if we drop the backwards time talk, is present together with the “offer wave” from the start and the combination of the two is the actual physical phenomenon. Although you have allowed for the transactional interpretation to be non-deterministic, my suspicion is that the confirmation wave probably does uniquely determine experimental outcome and that without the dubious pseudo-time echoing talk, there is just the one “chosen” confirmation wave that is physical, other “choices” only exist mathematically. The probabilistic nature of QM would then be the result of our inability to know the “confirmation wave” component, only knowing the “offer wave” component – we can work out what the “choices” are, but we cannot know which of these “choices” is the one that is actually physically present until after the measurement. With the removal of the backwards time and pseudo-time talk, escape from Bell’s inequality essentially amounts to a violation of counterfactual definiteness rather than violation of some form of locality or strong causality. (I haven’t thought through all the details but my suspicion is that without backwards time talk, violation of “strong causality” or locality is actually the same thing as a violation of CFD – whether one says that the value is determined by a future or non-local “cause” (non-locality or violation of strong causality) or that a definite value is “undefined” and meaningless in calculations without a “factual measurement” (violation of CFD), probably amounts to a difference of terminology, and perspective regarding what it means for an observable to have a value, rather than an actual physical difference). If and when you have the time, feedback on my comments would be most welcome. Although you wrote your column on Light In Reverse Gear http://www.npl.washington.edu/AV/altvw08.html way back in 1985, I only came across it last night. Although I had been aware of the concept of advanced electromagnetic waves from when I was a highschool kid in the early 80s, I had never given them much thought, immediately dismissing them as an extraneous solution ruled out by causality. I had some renewed interest around the early 90s when your Transactional Interpretation of QM became widely known but here one was focusing on QM wavefunctions and I gave little thought to advanced electromagnetic waves. I had done my undergraduate degree in both Theoretical Physics and Pure Mathematics but went to on to do a PhD in Pure Mathematics and did not pursue further detailed interest QM after that. I subsequently ended up disillusioned with academic life, particularly the poor remuneration and ended up in the world of IT and software engineering. However I am getting to a point in my life where I have started to have more time to return to academic matters and have been encouraged to return to academic research in particular the foundation of QM as 20 years after doing my PhD people have become interested in applying my results (in the theory of Interior/Closure Algebras which are related to Modal Logic) to various subjects including QM. I am currently catching up on research into the foundations of QM and have been reading papers on the Transactional Interpretation, which to me seems the most promising approach currently available – approaches which attempt to derive QM from probability spaces and orthomodular lattices seem to be a dead end and deeply flawed (despite these approaches being the reason for my renewed interest in the subject). But anyway, back to advanced light waves. Last night was the first time I had really given any serious thought to advanced light waves and after reading your article and the discussion of why there seem to be no advanced electromagnetic waves, it struck me that possibly the solution is quite mundane and the real reason is that the mathematical formalism is being misunderstood: Could it not be that the advanced wave solutions are really just an alternative description of the normal retarded waves? If an object A emits an advanced wave at time t1 then at t1 its energy increases (i.e. object A releases a negative amount of energy so its energy is greater for times t >t1 than for times t<t1. The advanced wave travels backwards in time until at some time t0 < t1 in the past it encounters an object B that absorbs it. Then B shows a decrease in energy at t0, it absorbs the negative energy and had more energy for times tt0. Now, for me at least, an obvious question is, how is this scenario any different from saying that that object B emitted a lightwave at time t0 (losing energy in the normal way) and that A aborbed the light at time t1 gaining energy in the normal way? To me it seems that a wave going backwards in time carrying negative energy is just an alternative description of a wave going forward in time carrying positive energy. So advanced and retarded waves are actually the same thing described from different perspectives. Or am I missing something? Your comments would be most appreciated. and making its way across the Atlantic on a ship to the US at this very moment. Colin, I present (in my recent papers and my book) a new development of TI that I call ‘Possibilist TI’, in which OW and CW are not propagating in spacetime. So the processes that Cramer discusses in terms of ‘pseudotime’ are in my picture sub-empirical, sub-spacetime processes. All absorbers do respond to an OW with CW, however only one of those CW responses results in an actualized transaction and it is only the latter that transfers real energy. I view this process as a kind of symmetry breaking. One paper that disusses the process from the relativistic standpoint is here: http://arxiv.org/abs/1204.5227. A more complete discussion is in my book. “…thought is not contained in spacetime…” . “That is, a thought or idea is not reducible to electrical impulses”. What do you mean by this? Is there any evidence for this? Are thoughts shown not to be reducible to electrical impulses or is there simply not enough data on this? I tried searching for “Quantum physics and neuroscience” and couldn’t find any scientific articles that would suggest that quantum mechanics was established to be neceassary to describe thoughts. I also have a question about the transactional interpretation – it appears to me that the emissions and absorbtions of offer/confirmation waves correspond to terms in perturbative approach to QFT. It seems to me that a Feynman diagram can be associated with each transaction, is it so? You discuss virtual particles in your book, but I think these are merely artifacts of the perturbation theory. Can PTI be defined (or is it in fact defined) nonperturbatively? (1) Nobody really knows what thought is. We can find observable correlates of mental activity–i.e. electrical impulses in the brain–but this does not demonstrate that thought is no more than those impulses. If someone claims that thought is reducible to observable electrical impulses, the burden of proof would be on them to demonstrate this. But since thought is a private, inner perceptual experience, there is no way this could be demonstrated empirically (where ’empirically’ means in a way subject to 3rd-party verification). That is, supposed I am inwardly thinking about eating an apple. The only thing observable empirically is an electrical current in a certain part of my brain. But there is nothing about that electrical phenomenon that looks ‘apple-like’; nobody can tell what I am inwardly thinking about just by detecting that current. So clearly there is more to thought than what can be detected empirically. (2) Concerning the applicability of QM to mental activity: this is something I’m suggesting, based on my proposal that QM deals with sub-empirical processes. As noted above, thought is something that goes beyond the empirical realm because the content of thought is not subject to 3rd-party observation. (3) The basic entity that serves as precursor to offers and confirmations is the propagator, i.e. two-point field correlation. These exist in any interacting field theory. So this is not restricted to perturbative field theory. When we sum Feynman diagrams to get an overall amplitude for a scattering process, we are adding up different orders of a perturbative interaction in which no offers/confirmations are produced. If we have the kind of asymmetry leading to generation of offer and confirmations, this process is pre-empted and we get a transaction instead. So the first case corresponds to scattering and the second corresponds to a radiative process. Let me know if you have any more questions and thanks for your interest! Regarding 1), I understand that thought are not directly observable by third parties, but that surely doesn’t imply that they cannot behave clasically, as a macroscopic object. Isn’t there a case to be made that due to to enormous number of absorbers in the brain, any quantum state will collapse quickly? Do you see a reason why thought should be exempt from that? Is there anything preventing us to believe that thoughts could one day be exactly reproduced from physical measurements? It seem implausible to me from an evolutionary viewpoint thought should not be susceptible to naturalistic explanations and that it should have some “special” status. Regarding 2) Am I to understand that any unobservable phenomenon can be described by QM in your opinion? Also, I was wondering if you are planning to provide a more precise mathematical framework for the PTI? That would make it possible to study if it doesn’t contain internal inconsistencies or if some terms are not defined too vaguely, etc. I suspect the lack of such a formulation is one obstacle that might prevent most physicists from considering it seriously. Thanks Peter, there is a rigorous mathematical framework for the direct-action theory upon with PTI is based. This is discussed in my CUP book and in peer-reviewed papers. More are coming, one in particular focused on antiparticles and why we do not need the Feynman propagator to describe these in PTI. Re 1: If thought is something not fully captured by empirical (classical, ‘collapsed’) phenomena, then it could be an aspect of sub-empirical quantum reality. I don’t take a hard line on this, I just allow for that possibility. Re 2: no, I don’t claim that any unobservable phenomenon is necessarily described by QM. Rather, I think that QM refers to a class of unobservable phenomena. Thank you. You don’t know me, but I think you have given the world a glimpse of creative thinking outside that dam cat box…grin. 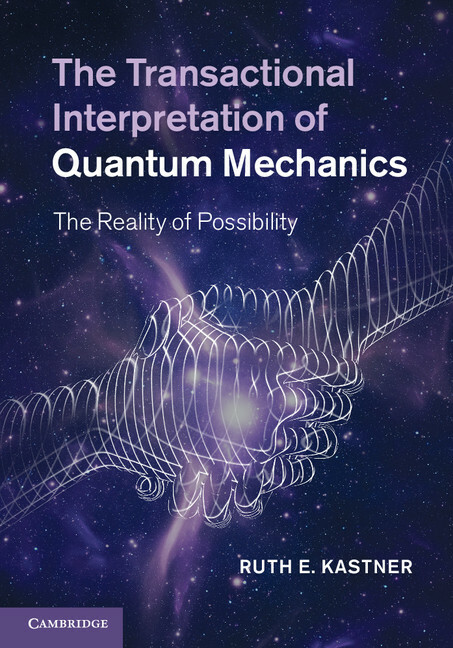 I read your book…The Transactional Interpretation of Quantum Mechanics. Bare with me for just a moment and invision a 73 year old jumping around the room going, Yes! Yes! I really kept doing that. Let me tell you that I have a BA from Umass and a Masters from Cambridge College, I created the national Section 8 (HAP) for HUD, I was the microcomputer specialist for the clark Science Center at Smith College, a Nike-Hercules Acquisition Radar Mechanic and was hired by Harvard for their Radio Telescope group when I beat their chess player during my interview. Ok, why all that? I want you to take something I have kept private all my life and share this story with you that you will find hard to believe…final note, I have documented this by telling close family members each time this occurred. This goes directly to the nature of thought…I am 16, I wake up and I know what has happened. I sit on the edge of my bed…some minutes later the phone rings and I find that I am right, my Dad just died from cancer. It is winter, I am older, and I am driving my car and stop at a light, my wife is next to me and I point off the right and tell her that two people are going to fall thru the ice on that pond. I don’t know exactly when…but the next day, I read that two brothers died later that evening in that pond, the second trying to rescue the first. Another time I am watching a loud exciting gun fight on a big screen at a mall theatre and I lean over to my Wife and I say, someone is stealing our car (a Celica GTS)…we decided to stay there because we did not want to confront them. When we came out, our car was gone and we called the police. I made the mistake of telling them it was three men. On 9/11 I woke up and ran to the TV and turned it on because I knew my daughter was in trouble…she had an apartment in lower Manhattan. It was up close and personal, but she was not injured. Another time I walked into a mall with my family to xmas shop…we split up and said we would meet at the door we came in at. Once alone, I had an urge to reach in my pocket and put my hand around my swiss army knife. I watched three men go out the door and started to follow them….then I went oh no! Someone is going to kill somebody here. I ran to that entry and waited for my family and we all went out at the same time. yes, somebody did get murdered in their car parked directly across from ours. So, I believe that your work goes to the nature of mind and thought and helps me understand this reality. There are more stories like this in my life. Thank you for helping me understand how this could happen. George. Wow! thanks very much for your kind remarks George, and for sharing these experiences. My work on TI doesn’t go into the paranormal, but if it’s true that possibilities are real (but unmanifest), it seems reasonable that some people could sense future possibilities like this. The Wheeler-Feynman or Davies formulations generally depend on eventually complete absorption. Yet most CMB microwave photons (and most other photons too) haven’t yet been absorbed over billions of years. And, with an increasingly accelerating expansion and diluted universe, it is unlikely they will ever be absorbed. Radiation gravitates. But how real can it be if we have highly incomplete absorption? A second challenge is that chemical (covalent) bonding depends on an effective enhancement of electron charge density between nuclei deriving from the Born Rule. This occurs in all bindings without observers or absorbers and is an example of squaring without transacting. However, standing waves may possess some intermediate reality. And they can be viewed as continually reinforced standing wave patterns both in forward-in-time waves and also in backwards-in-time waves. For the Born Rule, perhaps this strong reinforcement is key and above the concept of completed transactions. Thanks David, I’m glad you’ve enjoyed the new book. (1) The ‘light-tight box’ condition yields empirical equivalence of the Davies theory with standard QED. However, there is nothing to stop the basic direct-action theory from working (i.e. accounting for the Coulomb interaction and for radiated photons) in the absence of a complete light-tight box condition. If that condition were lacking (i.e. if we had only a partial absorption condition), it would open the door for some empirical deviation of the direct-action theory from standard QED. Interestingly, there are some empirical findings that stray from standard QED already (this is discussed in http://arxiv.org/abs/1312.4007 ); whether or not this might constitute support for the Davies theory remains to be seen. Also, Cramer (1983) has given an argument for an alternative to the light-tight box condition based on a perfectly reflecting t=0 boundary condition (this is mentioned in the above paper). So it is not strictly required that the universe be a ‘light-tight box’ in order for the W-F and Davies theories to work. That is just the requirement for exact empirical equivalence with the standard theory. Of course if you had no absortion at all, then the direct-action theory would fail. But we clearly have at least partial absorption. (2) I can’t claim to be familiar with the molecular bonding situation you describe here, but if the Born Rule is involved, that would seem to imply that there are absorber responses taking place at some level. I’d be happy to look into this further if you could provide one or more references on this issue. Again, many thanks for your interest and questions. For diatomic halogens, the picture is less clear with a dip/waist weaker density between nuclei largely due to having higher atomic radii (and bonding strength is half). Initially beginning with Thomas-Fermi model, modern Density Functional Theory (DFT) also looks at psi*psi for electron density. This makes PE understandable but requires finesse for KE. I feel that covalent bonding (time independent Schrodinger Eqn) requires broadening of TI to somehow include continual standing wave reinforcements (some intermediate reality). If the Born Rule were suddenly turned off, most matter would explode! (there would be no chemical bonding). But QM in chemistry is difficult, and physical explanations are still contentious (e.g., 2012, http://cdn.intechopen.com/pdfs/28320/InTech-The_role_of_quantum_dynamics_in_covalent_bonding_a_comparison_of_the_thomas_fermi_and_h_ckel_models.pdf). (article is a little lengthy) Thanks, Dave. Thanks for this–actually I don’t think that the talk here about ‘electron density’ means that there is an absorber response in this context. This is a typical way of discussing the most likely position(s) of electrons, but what is going on is physically accounted for at the ‘offer wave’ level. This sort of bonding takes place at the level of the Coulomb potential which exists in the absence of an absorber response. So I don’t see any problem or conflict here with PTI. This system is just a complicated bound state as discussed in my recent book. Let me know if you have any additional questions/concerns and thanks again! Is the second one more suitable for an introduction to non specialists readers ? Does it contain new theoretical developments, revised discussion ? I am presently reading reading the article of Wheeler – Feynman of 1945 (W-F) : “Interaction with the Absorber as the Mechanism of Radiation”. I realize that you are on the edge of this way of thinking physics which started with Mach (not cited in W-F paper), Tetrode, Ritz, Lewis, Wheeler, Feynman, Einstein, Cramer … Woodward (and his space thruster revolution). You are in good company ! I have a remark and a suggestion regarding Time, and a question regarding Photons – all in the PTI context. I fully agree with your perspective about Time. Found the following quote from your book as a close expression to my views about Time. I think changes are crucial for Time’s existence. Time cannot exist without changes. I understood this by making the simple observation that all the time measuring means or devices use some sort of standard changes for their time measurements. Another observation was that all the Time measuring units are based upon certain standard repeating processes or certain intervals between standard repeating events – all of course entailing some sort of change. There’s also other crucial part for Time’s existence (which is also implied in the quote above) and that is any sort of consciousness, but this part is not relevant now. Since Time is bonded with changes, after reading your book, I thought maybe this bond can be used to enhance your arguments about the abnormal (unactualized) reality before the transaction takes place vs. the normal (actualized) reality after the transaction occurs. I have no clue if what I am going to suggest is really accomplishable. I suggest showing mathematically that the unactualized reality cannot be affected in any way by any sort of change in the actualized reality. To be more precise, showing that once any transaction takes place producing actualized results, any change to the actualized results in the actualized space-time, cannot ever affect all those unactualized possibilities which were relating to the same actualized transaction prior to its actualization. If this could be shown mathematically, it would entail, considering the Time-changes bond, that the unactualized reality is also Time-proof of the actualized reality, meaning it is outside the actualized space-time. PTI explains how the fundamental transactions occur between quantas, when they occur. But can the PTI explain how or why transactions never occur among certain types of quantas like the Photons ?? My apology if the answer to this question is already given in book, which means I have missed it. Then indication of the page would be appreciated. Regarding your question “But can the PTI explain how or why transactions never occur among certain types of quantas like the Photons ? ?”– Transactions occur under circumstances that fulfill the conservation laws. This means that an emission of energy (as part of an actualized transaction) is only allowed for a system that can transition to a stable lower energy state, and similary for an absorption. This is why transactions only occur between objects that are bound, like atomic electrons. Another aspect is that the Dirac field (ie spin-half quanta like electrons) is sourceless, so strictly speaking a photon is not a ‘source’ of electrons even though photons couple to electrons. The coupling between photons and charged particles like electrons is not symmetrical. Charged quanta are sources of photons but not vice versa (to first order). Concerning your question about the unactualized reality not being affected by actualized reality: actually, I think there is a give and take between the two. Actualized events such as an emission/absorption pair can serve as the source of new possibilities. I don’t have a clear view of how the idea of Tetrode is incorporated in the Transactional approach of Physics. My understanding is that Tetrode considered that a radiation could not exist if there was not an absorber able to receive it somewhere in a causally connected future. If this is true, it should be impossible to send any radiation towards a black hole, as the confirmation wave emitted backward in time by the absorber inside the black hole (after the horizon limit) should not be allowed to escape it (if I am wrong and the backward radiation is allowed to escape, my example is in difficulty…).. The challenge here is that Tetrode’s theory is fully classical and does not address the quantum level. According to PTI, the future is not causally connected with the past since it is just a set of pre-spacetime possibilities. The causal spacetime connection is only established as a result of an actualized transaction. Now it’s also important to note that black holes are a classical construct, and there is some controversy as to whether they truly exist in a stable form (the QM information loss paradox). Remember that the classical theory applied to atoms leads to rapidly decaying atoms–so classical physics has a limited range of applicability. We still need a fully quantum theory of gravity to decide whether black holes exist in the way the classical theory seems to suggest–i.e. as singularities in spacetime. This may not be the case. Thank you for pointing the uncertain status of black holes existence. I realize that in the analysis of my experience of thought I should have noticed that it takes already an infinite time, as seen from the emiter position, for the radiation to reach the black hole horizon and that this is sufficient to prevent any ‘handshake’ between OW and CW to occur. Actually, any ‘handshake’ would occur outside spacetime according to PTI. The spacetime interval between emission and absorption is a secondary property that arises out of the actualized transaction–that’s what creates the spacetime interval between emission and absorption. So in principle there could be a transaction, but from a the emitter’s vantage point the time interval would be infinite. Great question. You read my mind. I am just working on this issue now. Indeed, fermion transactions do not involve fermion confirmations. While any field theory can be formally recast as a direct action theory (Narlikar and others showed this), in view of energy conservation and spacetime constraints, fermionic transactions always occur by way of the interaction of the charged fermionic field with the em field. I will be posting something on the arxiv about this very soon. I should add that they are thought of as ’emitted’ and ‘absorbed’ eg from a cathode to an anode, but this is propagation from one bound state to another, never free propagation. This is accounted for very nicely in the transactional picture through photon transactions that indirectly actualize the fermion as an absorber/emitter of the photons that allow its (indirect) detection. Which in computer science they call “a stream.” It’s just a different model of time. nonStandardFuture and nonStandardPast are ‘halos’ of nonstandard points infinitely close to standardNow, behind and in front. Only possibilities exist in the nonStandardFuture and information only exists in the nonStandardPast. In terms of game theory, possibilities in the nonStandardFuture are like squares where the player can move. The scoreboard for the game exists in the nonStandardPast. The ‘opposing player’ (wave function) gives the possibilities and assigns scores. The player (particle, e.g. in Bohm’s theory) guesses which trajectory per nonstdMonad– for example, one of the trajectories in the two slit experiment in Bohm and Hiley’s Undivided Universe. After the player guesses, the wave function reveals where it placed the ‘payoff.’ If it’s where the player guesses, great! The player takes it in and lives to play another day. But if the payoff occurs at some other possibility, the player regrets having chosen that possibility, say possibility X. (And has to live off stored payoff for a while). On the other hand, say the player chooses some possibility other than X, and then on the reveal sees that the wave function placed the payoff at X. Now the player regrets NOT having chosen X. So for each possibility (each X), there is on the scoreboard the player sees (a) regret from having chosen X, when the payoff occurred somewhere else, and (b) regret from NOT having chosen X, when the payoff did occur there but the player chose some other possibility. Complex numbers, as the wave function, model possibility. First, of all the types of numbers, one wants one of the division algebras– because a possibility can always be removed from play, which we model as division. A numerical product of possibilities is the logical ANDing of those possibilities. One doesn’t want real numbers to model possibility, because they relate by the greater than/less than relation. But possibilities are not like that– something either IS a possibility or IS NOT a possibility. Greater than/less than relations one may leave for probabilities. Further, one wants the product of possibilities (the logical ANDing) to commute– we don’t care which one comes first in the statement. Of all the division algebras (real, complex, quaternion, octonion) that leaves only the complex numbers standing. I have to say it like that because in the nonStandardFuture, only possibilities exist– not yet the particle. particle = (physicalExtension, particle), zipped to the above equation for proper time. So Psi Psi* = P per possibility, the Born rule. Thanks, I’m not familiar with Robinson’s formulation, but it does sound like a natural mathematical language for quantum possibility. Also, of course when you read my work, you’l see that I take the “NonStandardFuture/Past” as essentially describing the future and past in our world. As well as to the stream of such pairs. Not some of that other stuff about this in the top half of the previous note. Out of kindness I will leave the identities of the equations un-known. But they know who they are. Notice how ‘physicalExtension,’ ‘pE’ got injected into properTime. deep inside the shelter of properTime. that streams from the existence of a particle. Thanks for all this fascinating material! I am currently traveling but will think about all this more when I get the chance.